I mean I did. I’m not frozen somewhere, but my running didn’t. I did good for a long time. I ran in circles at the Pettit. I ran on the treadmill. I wore 28 layers and ran outside. And then I just couldn’t do it anymore. I couldn’t handle more cold runs. I had a little mental breakdown over the weather. I hate that it got to me. I hate that I have basically thrown my spring goal out the window, but that’s life. I don’t hate running. I’m not giving up. I’m still running a half this weekend and another one in a month. I’m not worried about the distance. I just have no idea how long it’s going to take me to run 13.1 miles. I can guess, but who knows what my legs are going to say once I get out there. I keep adding to my Races for the year so clearly need to do something. Instead of running I have been enjoying the best sporting event of the year, March Madness. This year has been special, really special. 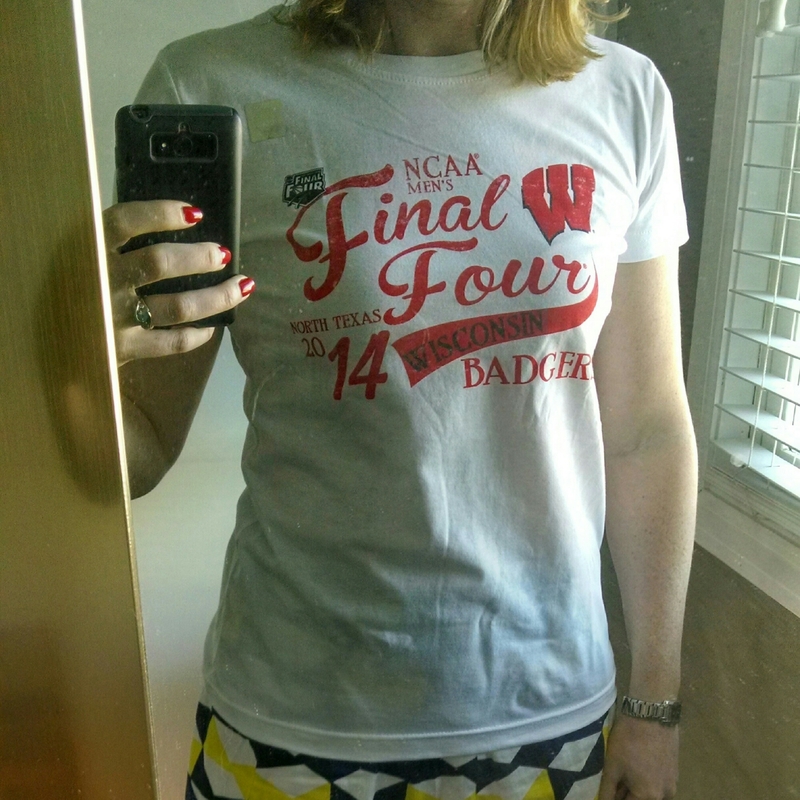 My Badgers are in the Final Four and as I told my brother, I’m a giddy idiot about it. I’m all set for Saturday! I have no desire to count up my miles for March because I know it’s a depressing number, but I just don’t care. I had an awesome month that started in Italy with my brother and ended with my team making the Final Four, and lots of crazy/fun adventures in between. We ALL have those running moments where we’re just “meh” and don’t have the mojo anymore. You’ll find it! Those halfs coming up will be the mojo kick in the pants you need. Thanks Jen. I know it will come back and I’m actually looking forward to the races. I feel defeated too.. I think I’m exhausted from fighting the weather all winter long, now that it’s actualy kind of nice I’m too exhausted to fight the wind. I hate Spring. It’s muddy, wet and windy. Can’t wait to complain about the humidity. I’m sure your 13.1s will go fine, stick with your run buddies and it’ll be good! I totally agree about the wind. It’s like mother nature hates us. Looking forward to seeing you in Kenosha.